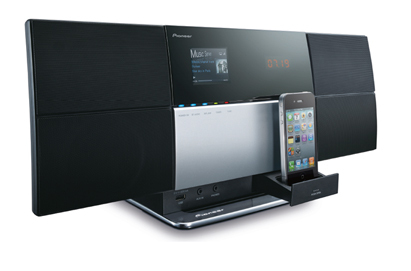 Pioneer has just announced two new iPod docks with the Airplay streaming. There are two new models, Pioneer X-SMC3-S(Pictured Above) and the X-SMC4-K Elite(Below). If you do not want to use AirPlay you can choose wireless or the 30-pin iPod dock connector, an Aux input and a USB port. The systems are almost exactly the same except the elite offers bluetooth as an add-on. They will be available in October for $400 for the X-SMC3-S and $480 for X-SMC4-K Elite.